From 114 take 26th street South exit. Travel approx.2mi. turn Right on John McCain for approx.2miles. Turn Right into Pebble Hill Neighborhood. Turn Left after entrance. Home on right hand side first corner lot. Hello, I’m interested in 7203 Belle Meade Drive and would like to take a look around. The details on 7203 Belle Meade Drive: This house located in North Colleyville, Colleyville, TX 76034 is currently for sale for $669,000. 7203 Belle Meade Drive is a 4,213 square foot house with 5 beds and 4.5 baths that has been on Estately for 3 days. 7203 Belle Meade Drive is in the North Colleyville neighborhood of Colleyville and has a WalkScore® of 2, making it car-dependent. 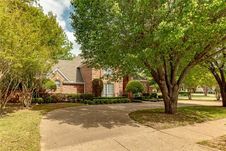 This house is in the attendance area of Cross Timbers Middle School, Colleyville Elementary School, and Grapevine High School.